MIT and Tufts researchers have shown that mechanical forces from cells that surround small blood vessels may control the growth of new vessels. (PhysOrg.com) -- Cancer researchers have been studying angiogenesis — the growth of new blood vessels — since the early 1970s, when Judah Folkman first theorized that tumors could be destroyed by cutting off their blood supply. For most of that time, scientists have focused on the biochemical signals that promote angiogenesis, in hopes of finding drugs that can starve tumors by blocking their ability to release the proteins that promote vessel growth. More recently, a few scientists have taken a new approach: studying how contractions in nearby cells can stimulate angiogenesis. 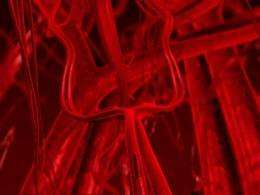 Krystyn Van Vliet, associate professor of materials science and engineering at MIT, and researchers at Tufts University recently showed that cells called pericytes, which surround small blood vessels, generate contractions that could serve as a mechanical signal to initiate angiogenesis. “Up to now, people have assumed that the role of pericytes was biochemical in nature,” says Van Vliet. Pinpointing the role of those mechanical signals could help researchers develop drugs that either promote angiogenesis to enhance wound healing or suppress the harmful angiogenesis that leads to tumor growth or vision loss (in age-related macular degeneration or diabetes-induced retinal damage), says Ira Herman, a professor of physiology at Tufts University School of Medicine and expert in pericyte cell biology who collaborated with Van Vliet on this study. Angiogenesis is vital for all body tissues: Without access to functioning blood vessels and their life-sustaining stream of oxygen and nutrients, cells can’t survive. Cancer cells, with their revved-up metabolism, especially need to stimulate blood-vessel growth because they require more fuel than ordinary cells. Folkman’s theory on angiogenesis and tumors spawned an entire research field — known as anti-angiogenesis therapy — as biologists scrambled to figure out how cancer cells turn on angiogenesis, and, more importantly from a treatment standpoint, how to shut it off. In the past 40 years, scientists have pinpointed more than a dozen proteins, known as growth factors, that appear to be involved in angiogenesis. They have also identified drugs, including endostatin and angiostatin, that have shown some ability to slow tumor growth by interfering with those factors. Those drugs are now being tested in clinical trials. The FDA recently approved an antibody drug known as bevacizumab for use in some metastatic cancers. That drug, marketed as Avastin, targets vascular endothelial growth factor, a protein that acts on endothelial cells (cells that form the lining of blood vessels). Those represent the first generation of angiogenesis drugs, but the field holds promise for many more once scientists learn more about angiogenesis and the different cells involved, says Marsha Moses, director of the Vascular Biology Program at Children’s Hospital in Boston, who believes pericytes are a very promising target. Van Vliet and Herman’s research is an important step towards better understanding pericytes’ role in angiogenesis, Moses says. “They have not necessarily shown the direct effect on angiogenesis, but they’ve laid the groundwork for a series of studies” that should reveal whether pericytes will become a viable drug target, she says. Herman, a cell biologist, has been studying pericytes since the early 1980s. In 2007, he first reported that pericyte contractions might trigger angiogenesis, but he didn’t have a good way to measure the forces they generated, or to visualize how they would affect surrounding cells. He recruited Van Vliet, an expert in atomic force microscopy who studied angiogenesis as a postdoctoral associate in Moses’ lab at Children’s Hospital, to explore this issue. In graduate school, Van Vliet had worked on measuring the mechanical behavior of metals at the nanoscale and studying how that behavior influences macroscopic behavior. “I wanted to see if I could apply some of these nanoscale mechanical tools to biological problems,” such as how cells interact with materials, and how those chemical and mechanical interactions at the cell-material interface can affect cell functions such as angiogenesis, says Van Vliet. In a paper published in April in the Journal of Physics: Condensed Matter, Van Vliet, Herman and MIT students Sunyoung Lee, Adam Zeiger and John Maloney and Tufts research associate Maciej Kotecki reported measuring and imaging the force of pericyte contractions using an atomic force microscope — the first time that had ever been done. Atomic force microscopy generates very high-resolution images (about 5-nanometer resolution) by “feeling” the surface of a sample with a tiny probe tip. The researchers believe that pericyte contractions exert influence on blood-vessel growth by either directly tugging on endothelial cells or altering the stiffness of the membrane underlying the endothelial cells. In current studies, Van Vliet and Herman are investigating how the pericyte forces affect endothelial cells’ growth rate, shape and chemical secretions. They hope to determine whether pericyte contractions can act as an “angiogenic switch,” turning on blood vessel growth. They are also trying to determine the mechanism by which the pericytes exert their forces, which appears to involve inducing a network of cytoskeletal proteins to tense up, pulling in the cell membrane. The researchers have already identified a few drugs that can interfere with the pericyte contractions by disrupting the activity of those cytoskeletal proteins. Such drugs could potentially be useful for anti-angiogenesis therapy, but only if they could be delivered specifically to the target cells, says Herman.